From the original 50mls of Kombucha tea that was used to harvest the first samples of scoby to a farm of scoby. I have the original mother at home, she lives in the kitchen and is feed regularly with sweet black tea. Once every 10 to 14 days I drain the tea and store the brew in the fridge to drink. It tastes like a dry cider, slightly fizzy and a little alcoholic as it is fermented. The samples are grown in takeaway containers for convenience of cost and accessibility . The "farm" is set up as you would a home brewing system with the kombucha given a germ free environment to grow and feed in and a water chamber to "burp" in. Fermentation of sugared tea with a symbiotic culture of acetic acid bacteria and yeast (tea fungus) yields kombucha tea. Kombucha tea is a slightly sweet, slightly acidic refreshing beverage consumed worldwide. 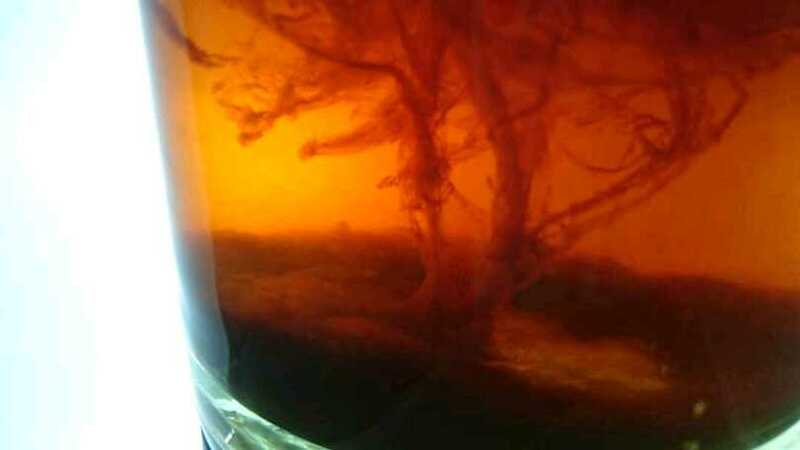 It is obtained from infusion of tea leaves by the fermentation of a symbiotic association of bacteria and yeasts forming “tea fungus” (Chen and Liu 2000). A floating cellulosic pellicle layer and the sour liquid broth are the 2 portions of kombucha tea. Though green tea can be used for kombucha preparation, black tea and white sugar are considered the finest substrates. In the 1960s, science researchers in Switzerland reported that drinking kombucha was similarly beneficial as eating yogurt. Kombucha tea is prepared by placing the kombucha culture (tea fungus) into a sugared tea broth for fermentation. The standard procedure is as follows: tap water (1 L) is boiled and during boiling 50 g sucrose is stirred in. Then 5 g tea leaves is added and removed by filtration after 5 min. 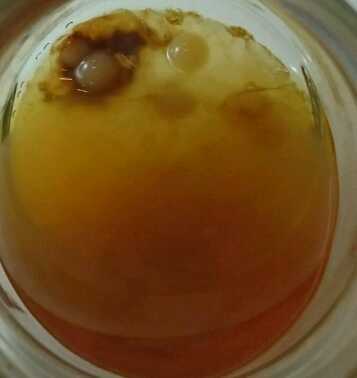 After cooling to room temperature (20 ºC) the tea is inoculated with 24 g tea fungus (the culture) and poured into a beaker (1 L) previously sterilized with boiling water. The growth of undesirable microorganisms is inhibited by the addition of 0.2 L previously fermented kombucha, thus lowering the pH. The beaker is covered with a paper towel to keep insects, especially Drosophila fruit flies away. The incubation is carried out at 20 ºC to 22 ºC. The optimal temperature is in the wide range of 18 ºC and 26 ºC. symbiotic growth of acetic acid bacteria and osmophilic yeast species in a zoogleal mat which has to be cultured in sugared tea. One of the clearer accounts of the microbes found in kombucha starter is from Hesseltine (1965). He isolated an Acetobacter sp. (NRRL B-2357) and 2 yeasts (NRRL YB-4810, NRRL YB-4882) from a kombucha sample received from Switzerland and used these microorganisms to produce kombucha tea. The most abundant prokaryotes in this culture belong to the bacterial genera Acetobacter and Gluconobacter. The basic bacterium is Acetobacter xylinum (Danielova 1954; Konovalov and Semenova 1955; Sievers and others 1995; Roussin 1996). 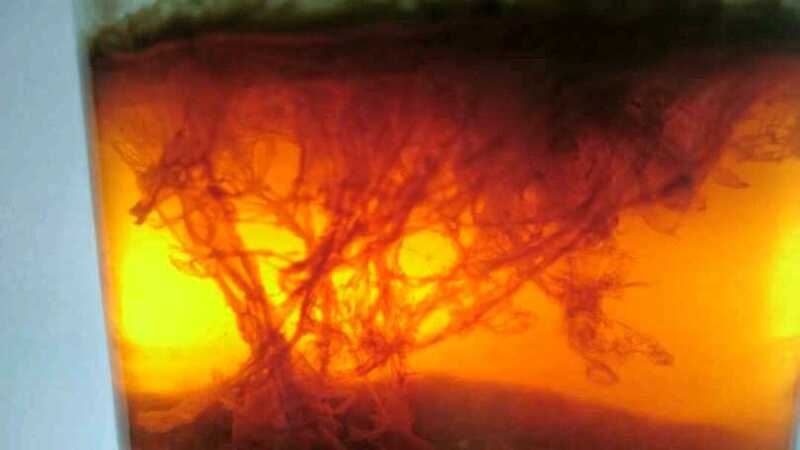 It produces a cellulosic floating network on the surface of the fermenting liquid. The network is the secondary metabolite of kombucha fermentation but also one of the unique features of the culture (Markov and others 2001). Sievers and others (1995) reported that the microflora embedded in the cellulose layer was a mixed culture of A. xylinum and a Zygosaccharomyces sp. The predominant acetic acid bacteria found in the tea fungus are A. xylium, A. pasteurianus, A. aceti, and Gluconobacter oxydans (Liu and others 1996). Gluconacetobacter sp. A4 (G. sp. A4), which has strong ability to produce D-saccharic acid-1,4-lactone (DSL), was the key functional bacterial species isolated from a preserved kombucha by Yang and others (2010). Strains of a new species in the genus Acetobacter, namely Acetobacter. intermedius sp. nov., were isolated from kombucha beverage and characterized by Boesch and others (1998). Dutta and Gachhui (2006, 2007) isolated the novel nitrogen-fixing Acetobacter nitrogenifigens sp. nov., and the nitrogen-fixing, cellulose-producing Gluconacetobacter kombuchae sp. nov., from kombucha tea. An investigation by Marsh and others (2014) indicated that the dominant bacteria in 5 kombucha samples (2 from Canada and one each from Ireland, the United States, and the United Kingdom) belong to Gluconacetobacter (over 85% in most samples) and Lactobacillus (up to 30%) species. Acetobacter was determined in very small number (lower than 2%). Chemical composition of kombucha teaChemical analysis of kombucha showed the presence of various organic acids, such as acetic, gluconic, glucuronic, citric, L-lactic, malic, tartaric, malonic, oxalic, succinic, pyruvic, usnic; also sugars, such as sucrose, glucose, and fructose; the vitamins B1, B2, B6, B12, and C; 14 amino acids, biogenic amines, purines, pigments, lipids, proteins, some hydrolytic enzymes, ethanol, antibiotically active matter, carbon dioxide, phenol, as well as some tea polyphenols, minerals, anions, DSL, as well as insufficiently known products of yeast and bacterial metabolites. The investigations of the beverage were always conducted under static conditions by the following: (Konovalov and Semenova 1955; Danielova 1957; Steiger and Steinegger 1957; Reiss 1987; Hauser 1990; Sievers and others 1995; Blanc 1996; Liu and others 1996; Roussin 1996; Petrović and others 1999; Bauer-Petrovska and Petrushevska-Tozi 2000; Chen and Liu 2000; Lončar and others 2000; Malbaša and others 2002a, 2008a, 2008b, 2011; Chu and Chen 2006; Franco and others 2006; Jayabalan and others 2007, 2008a; Kumar and others 2008; Wang and others 2010; Yang and others 2010; Yavari and others 2010, 2011; Velićanski and others 2013; Vitas and others 2013). Yeasts and bacteria in kombucha are involved in such metabolic activities that utilize substrates by different and in complementary ways. Yeasts hydrolyze sucrose into glucose and fructose by invertase and produce ethanol via glycolysis, with a preference for fructose as a substrate. Acetic acid bacteria make use of glucose to produce gluconic acid and ethanol to produce acetic acid. The pH value of kombucha beverage decreases due to the production of organic acids during fermentation (Dufresne and Farnworth 2000). In ancient days, this cellulose biofilm was used for the treatment of wounds. Microbial cellulose synthesized in abundance by A. xylinum shows vast potential as a novel wound healing system (Czaja and others 2006). Figure 2. (A, B)–Scanning electron microscope image of the consortia of yeasts and bacteria in a portion of tea fungus (magnification 2a = 3500× and 2b = 2700× (reproduced with prior permission; El-Taher 2011). Dried tea fungal biomass has been efficiently utilized as a biosorbent to remove metal pollutants from waste water by several researchers worldwide (Murugesan and others 2005; Mamisahebei and others 2007; Razmovski and Šćiban 2008).